If I say Iraq, what comes to your mind? Most people might not associate it with the Miss Iraq Beauty Competition. 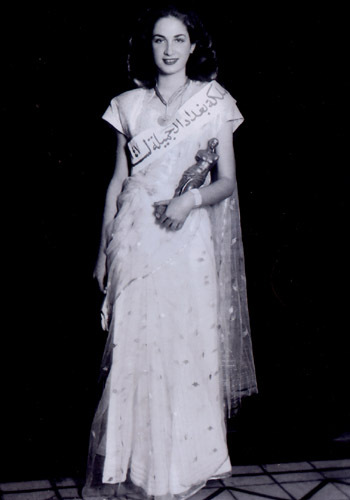 This competition started in 1947 with Renee Dangoor as Miss Iraq and has since been held annually and was preceded by the Miss Baghdad competition that started as early as 1934. Renee was Jewish, and scrolling through the winners the differences reveal a society that hosted plural religions and ethnicities, where a certain name or background didn’t hold you back from public achievements. During the centuries the competition developed accordingly with the surrounding world; it became a scholarship program; in the 70s the swimming suit part was removed in response to the feminist movement (although reintroduced later on); and in 2002 an attempt was being made to merge it with an Iraqi Eurovision song context. As time had it’s influence – in 2003 when the society started to collapse and extremist groups began their ruling by fear, it became impossible to hold the competitions inside Iraq. Since then it has been staged abroad: in Kenya, France and Turkey. Wealthy liberal Iraqis outside the country set up the competition and young Iraqi women in exile participated. Iraqis I know often speak about the good old times, when Iraq was a dynamic and rich society, not the sad and messy country we are so used to from the news today. The struggle for the Iraqi beauty competitions might be a reminder for people whos country no longer is. In the last years, the circumstances around the competition has taken a new turn: the participants consists of less and less women of Iraqi descents. In 2006 the newly crowned miss Iraq Tamar Goregian resigned after four days – she had been threatened by an extremist group calling her “the queen of infidels”. Before taking the decision to step down, when still hopeful, Tamara bravely said: “Maybe beauty is the final step to end violence and preach world peace after all. The power of beauty surpasses the ugly face of politics and greed.” Other participants pulled out after her. Even though being outside, they didn’t feel safe. Now white women from former Yugoslavia and Spain have taken the places of the Iraqis. No matter what one might think about beauty pageants, in a free world everyone should have the right to join one or demonstrate against it. I hope the Iraqi women will come back one day and claim their rightsome place. I didn’t know about this. Thanks for sharing. the pageant has been going on since 1947, they never missed a year, even during the 1990’s it was there, it did not resume in 2006, there was always a pageant every year. Hi! Thanks for the correction regarding the 1990s (the correct information is that the winners couldn’t participate in international competitions due to lack of funding), I have corrected it in the blog text. Regarding the year it started, I have used Talant Pageants official site (http://iraqibeauties.blogspot.se/) and the official site dedicated to Renee Dangor (http://www.dangoor.com/Renee/Homepage.html), managed by her family. They both claim the year of 1947 to be the year it started. If you have other sources of information that claims something different, it would be great if you could pass on the source. Miss Iraq Beauty contest started in 1947, its sometimes called Iraq’s queen of beauty or beauty queen of the year. It was never turned into a TV production though, during the 1990’s it was open for any resident of Iraq, you didnt have to be a citizen, 1990-2005, residents living in Iraq for over 2 years could compete during the beauty queen of the year contest. Hi! I doubt that the majority of foreign women that have participated have been living for over two years in Iraq? You should note that there was a large community who had a permanent residency in Iraq, they were Greeks, Turks, Italian, Yugoslavian, etc.. and yes they have lived in Iraq for decades, some have been there since Ottoman rule, and others came in later. I am an Iraqi I should know. Hi Rania! Thank you for reading my blog so carefully. I have seen the list of the winners and have no information on them having citizenship in Iraq – if you do feel free to pass on. Even if they do have legal status in Iraq, I think it’s sad that no original Iraqi women felt secure enough to hold the position as a beauty queen. That was the main point of my article. I was talking about the 1990’s, the 2003 -2005 were held in Kenya so the entrants were Iraqis who lived outside of Iraq or if they had one parent who was an Iraqi, remember the former regime handed Iraqi citizenship to somalis, some Palestinians, and some europeans ( yugoslavs) who worked in Iraq. I hope the Iraqi women will do so too. Lovely post. Thank you JC.